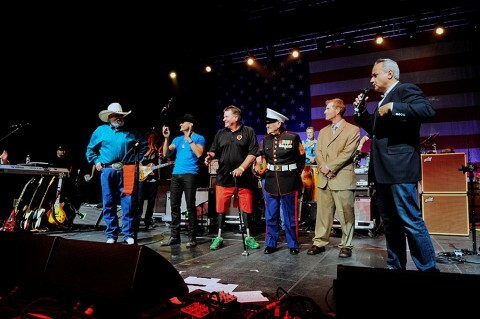 Nashville, TN – On Wednesday night the sold-out crowd at the Bridgestone Arena in Nashville, TN was brought to a standing ovation when four war heroes were invited onstage and presented with Henry Military Service Tribute Rifles during the Charlie Daniels’ 40th Anniversary Volunteer Jam. Anthony Imperato, President of Henry Repeating Arms, gifted the rifles to thank the veterans for their heroic contributions to our country. (L to R) Charlie Daniels, Ryan Weaver, Scott Schroeder, Jack Ten Napel, Sam Schoenheit, Anthony Imperato; President of Henry Repeating Arm.